Posted on August 2, 2016 in Community by Lindsay Vermeulen. Most writers suffer from writer’s block from time to time. If you’re working on personal writing projects (that breakthrough novel is coming! ), it’s just another part of the cycle. But sometimes you have to write—say, if you’re a professional writer who is on the clock, and you have strict deadlines to meet. In that case, it can be a huge problem—and you need it gone, now! If that’s you, don’t panic. Here are some easy strategies for getting over writer’s block and getting your content done on time. A blank page can be overwhelming. Sometimes you don’t want to spoil it. You don’t know where to start, or you’re worried that whatever you put on it won’t be good enough. The key is just to dive in, and free writing is a great way to do that. Free writing is simple. Set a timer, sit down at your keyboard or your notebook, and start writing. You can pick however long you like—I usually opt for 10 minutes. The only rule to free writing is that you have to keep writing. It doesn’t have to be on topic, and it doesn’t have to be any good. It doesn’t even have to be full sentences. You can repeat one word over and over, as long as you keep writing. You’re only allowed to stop when the timer is done. Free writing generates a lot of garbage, but you’ll also find that a surprising number of quality ideas slip in. And it helps you get into the rhythm of writing—so when you’re done, it’s easier to get going on whatever you’re actually supposed to be working on. What are some concrete examples of content marketing? Who is doing content marketing, and why? What has changed recently in content marketing? What group of things does content marketing fit into? How is it different from the other things in the group? Heuristics are especially useful for writing that requires research, since they give you an idea of what you’ll need to find out. They’re also great when you’re trying to find something new to say about a popular topic. If you’re writing on a topic you already know about, the main issue is organizing your ideas. Spend a few minutes jotting down anything you might want to include, likely in point form (short notes—they don’t have to be full sentences). These can be as broad or as specific as you like. If you’re more of a visual person, try putting down your ideas in a tree or cluster. Once you’re done, go through the list and sort the ideas into categories. Eliminate the ones that don’t fit, and add new ones that will help round out categories that are looking a little light. And, BAM! You have an outline. You’re welcome. Now get writing. A lot of the time, when people get stuck writing it’s because they’re worried they’re going to do a bad job. Do you write a few sentences, reread them, and delete them? Do you freak out when you look over something you just wrote because it’s so bad? Stop. First drafts are pretty much always terrible. That’s why we have revision. The first drafts of some of your favourite authors were probably nearly unreadable. But if you keep editing and rewriting while you’re trying to create, you’re never going to get anywhere. So resist the temptation to reword that sentence/rearrange all your paragraphs/delete everything until you’re completely finished writing. Once you get going, you’ll get into a rhythm and find it’s a lot easier to continue. Plus, the final product will have a more natural flow than if you hammer it out word by agonizing word. Generation and evaluation are separate parts of the writing process, and they require different parts of the brain and ways of thinking. So instead of trying to multitask and doing a half-assed job of both tasks, take it one step at a time. Write now, evaluate later. Turn off your spell-checker if it helps. If you think you’re going to sit down and write your whole 2,500-word paper in one go, think again. Unless you’re Jack Kerouac, you’re going to get distracted, get antsy, get hungry and run out of ideas. That doesn’t mean you’ve failed. Instead of hopping on Facebook whenever there’s a lull in your creative energy, set small and manageable goals for your writing, and plan rewards for them. Maybe you’re allowed to spend 5 minutes on social media for every 500 words you write. Or maybe you get to go make a cup of tea and eat a cookie when you’re done your outline. Ideally, pick a leisure activity that doesn’t require much attention or brain power—you want to be able to give your thinking a rest and allow new ideas to come up organically, instead of throttling them with too much concentration on something new. I don’t necessarily mean picking the perfect day and time to write. A lot of writers are procrastinators, and if you’re reading this, there’s a good chance that whatever you’re writing is due tomorrow. You’ve got this! If you have a super limited amount of time to turn around your story, divide it up into ideation (that’s planning), drafting and revising. 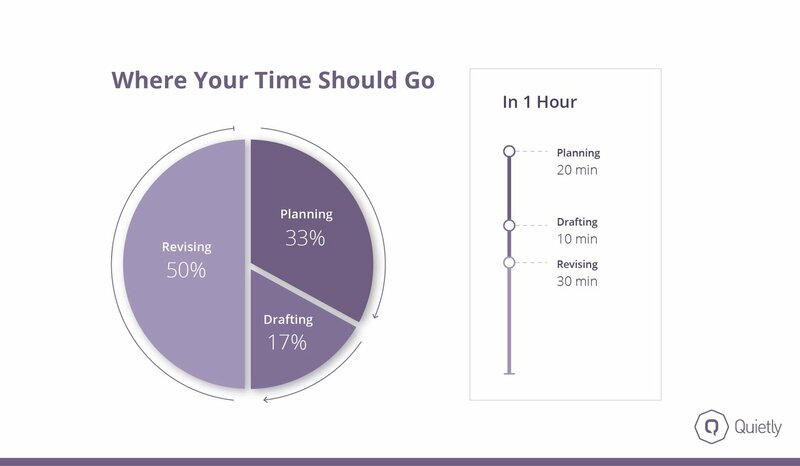 You’ll want to spend 33% of your time planning, 17% drafting and 50% revising. So if you have an hour to write in, you’ll want to spend 20 minutes planning, 10 minutes drafting and 30 minutes revising. Yes, you read that right. There’s a common misconception that writing is the most time consuming part of the process. But that’s because a lot of the time, people don’t do a solid outline before drafting, and they do a lot of editing while they’re going (which slows them down). If you separate them out properly, you’ll find that the actual writing hardly takes any time at all. Writer’s block affects pretty much everyone at some point, and it’s not because you’re not creative, or not smart, or not committed enough to the job. It usually happens because you care too much about doing it perfectly the first time through—which is pretty much impossible, so abandon that idea now. The best writers know that revision is an opportunity to make your piece stronger, not a punishment for doing a bad job. Take a deep breath, accept the inevitability of revision, and get writing! You’re going to be fine.